This nozzle assembly is a spare part for Mercedes type W124 (2-valve-type without Turbo), W201 and other Mercedes after 12/1988. Please take a look at the usage list. For Mercedes with Turbo the Turbodiesels were originally equipped with the same nozzle holder bute different nozzles (esd-314). 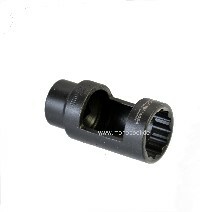 Please let us now your requirements - we can deliver KCA27S55 nozzle holders assembly with esd-314 too. This nozzle guarantees Diesel-like starting of the engine. Note: When replacing a nozzle assembly new flame arrester plates fss-uni are required. Please order 1 flame arrester plate per nozzle assembly.